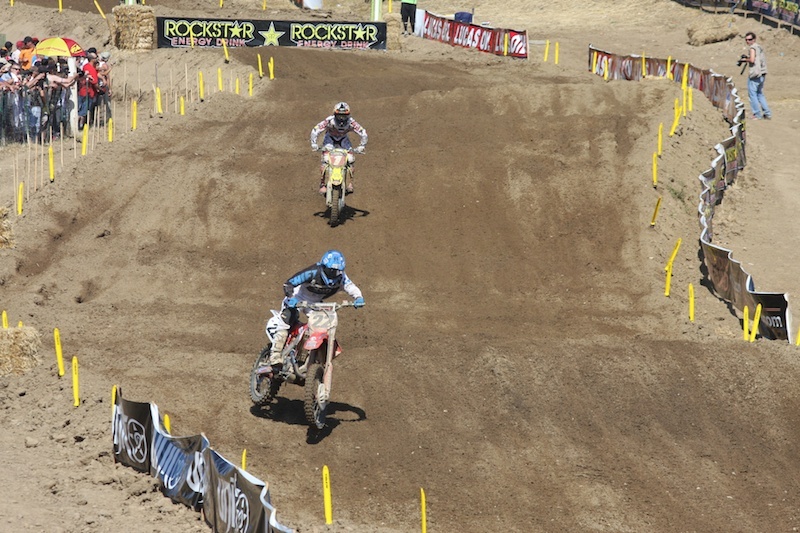 Jimmy and I went to Sacramento this weekend to watch some very loud dirtbikes go very fast. 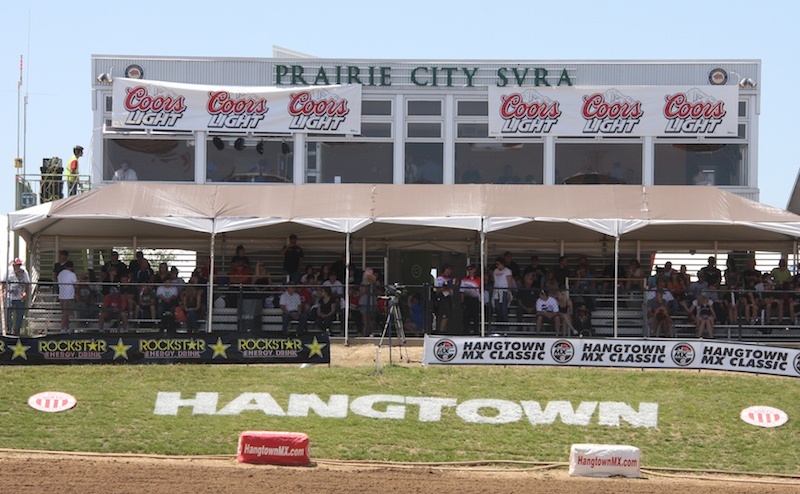 It was the season opener for Motocross, Hangtown at Prairie City. Admittedly, this event is more interesting to Jimmy than to me, but it sure it fun to people watch. And there were lots and lots of people to watch. 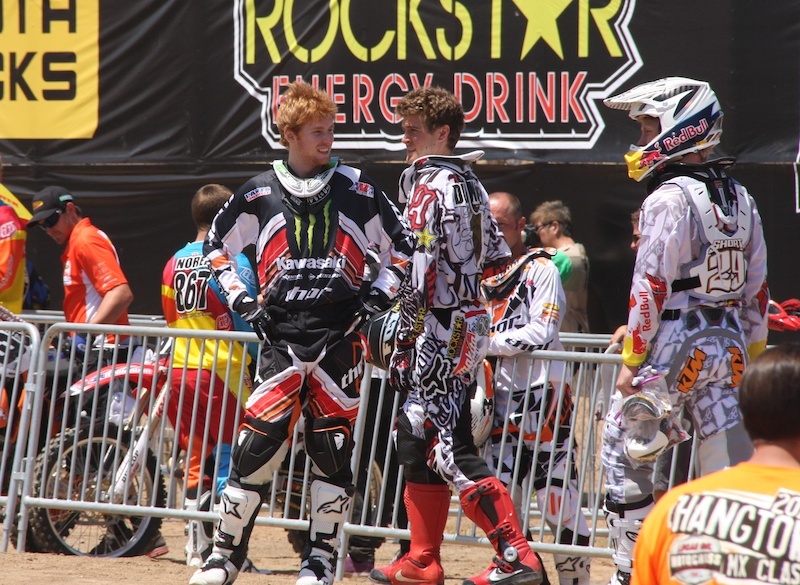 But it's also fun watching the riders.Here's Ryan Villopoto #2 (22 years old from Seattle Washington), Ryan Dungey #1 (21 years old from Minnesota) and Andrew Short #29 (28 years old from Texas). They're at the start line before the race. The Ryan's are chatting and deciding on the line or path they're going to take. 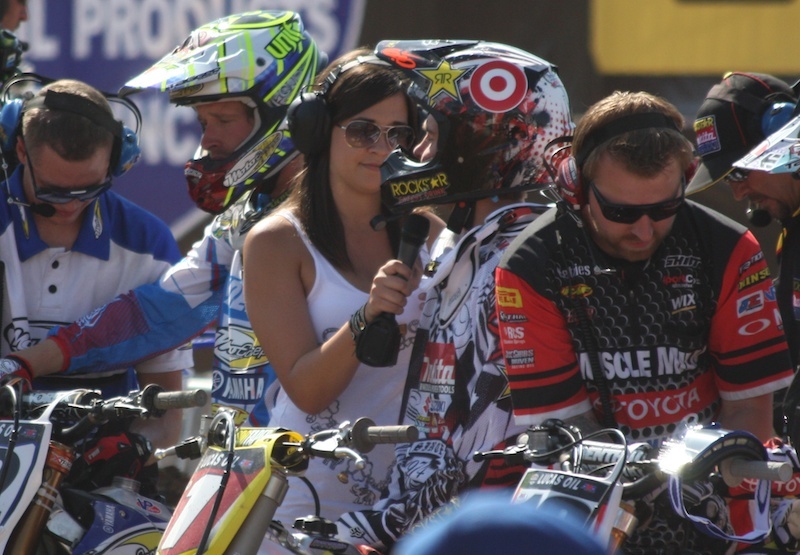 Just minutes before the race begins, Ryan Dungey does a quick interview. He's last year's champion. 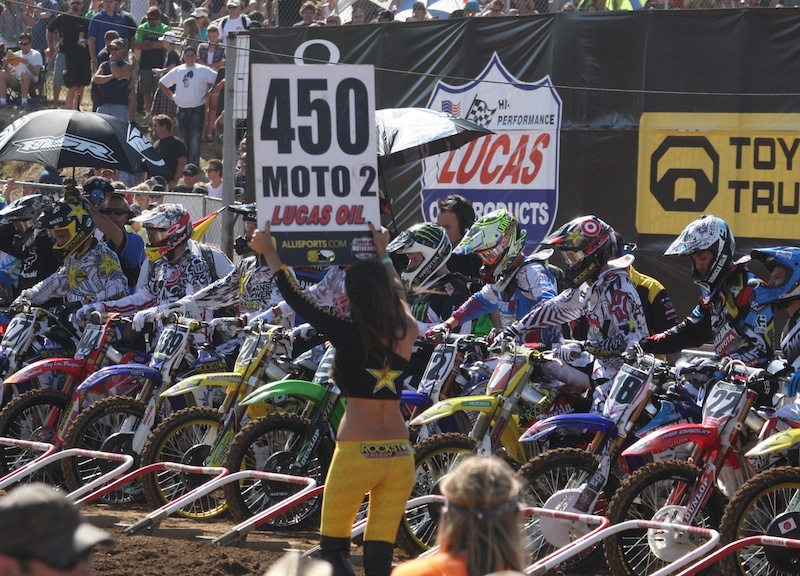 When the Rockstar Girl walks by with the 450 sign, we all know it's just seconds before the race will start. The gates are down, the engines roar, and they're off! 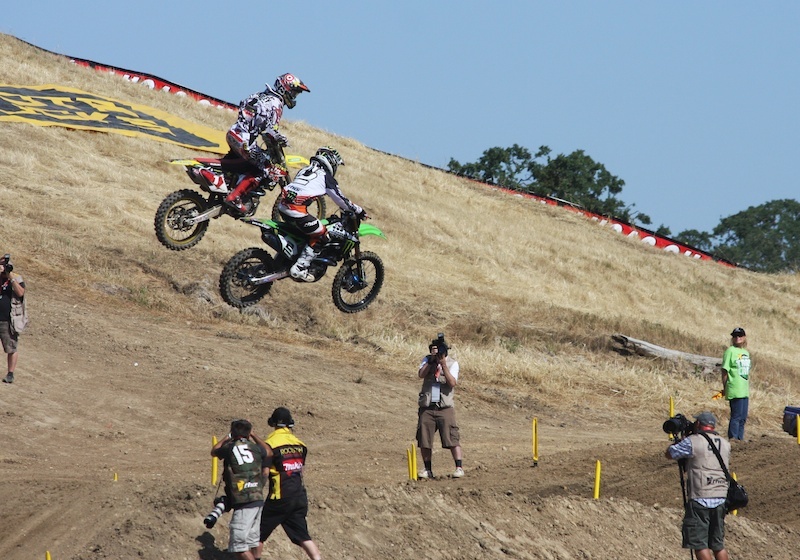 Ryan Villapoto (#2 in the green bike) is ahead! But the other 39 riders are still close behind. For much of the race, he keeps his lead. 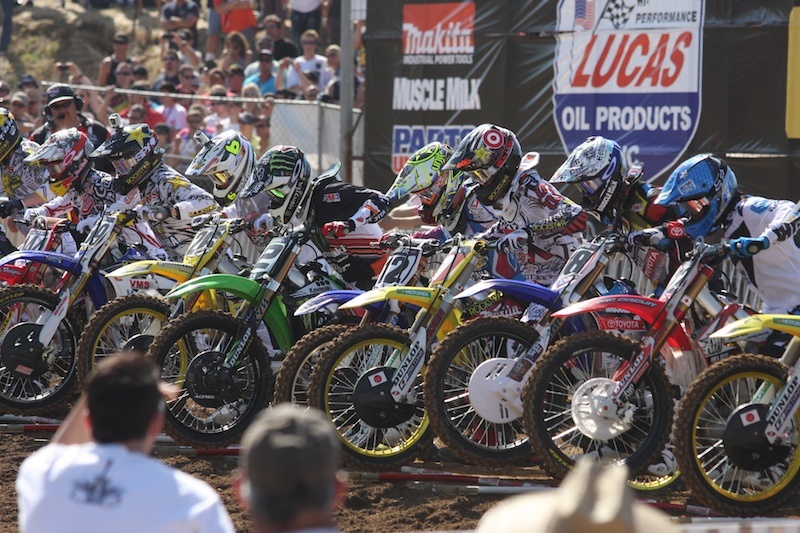 He's on the left (#2), but Ryan Dungey (#1) and Chad Reed (#22) are very close behind. 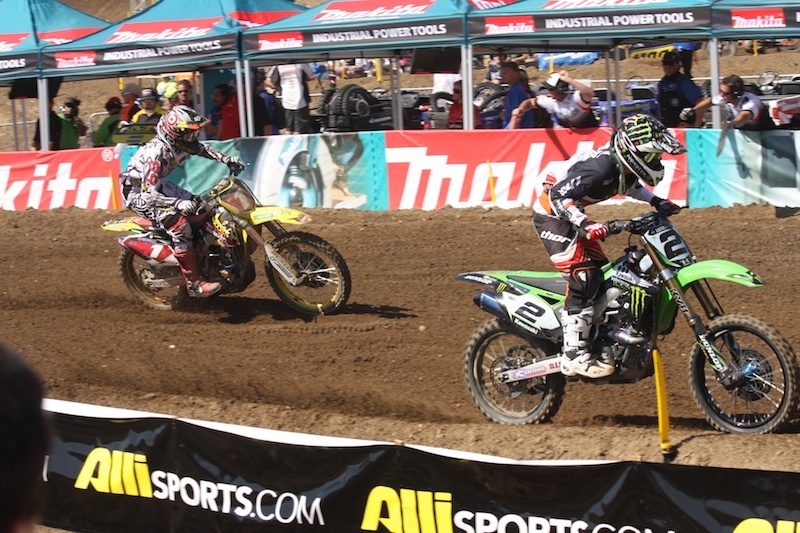 Villapoto (#2) roars in front of us, just keeping ahead of Dungey (#1) right on his tail. The Ryan's are fighting for 1st place. 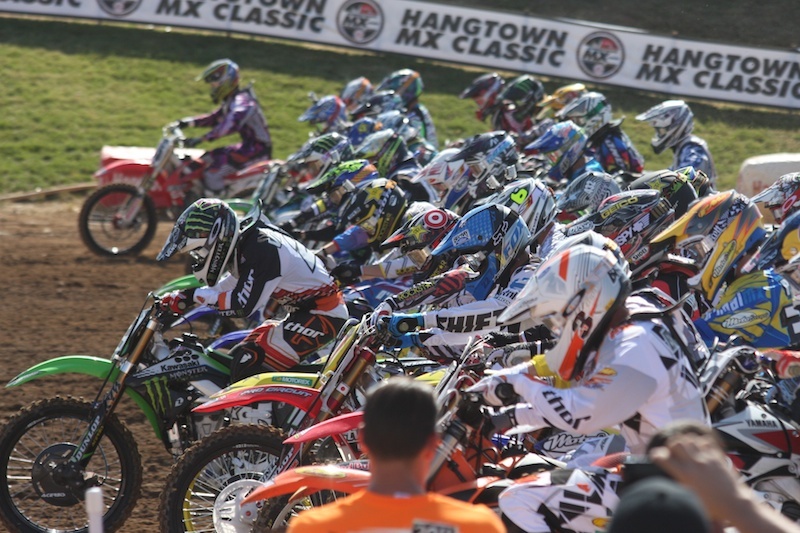 Dungey (#1) has passed Villapoto (#2) and Chad Reed (#22) isn't far behind in 3rd. A few more laps passed then Chad passed Villapoto and gained 2nd position. 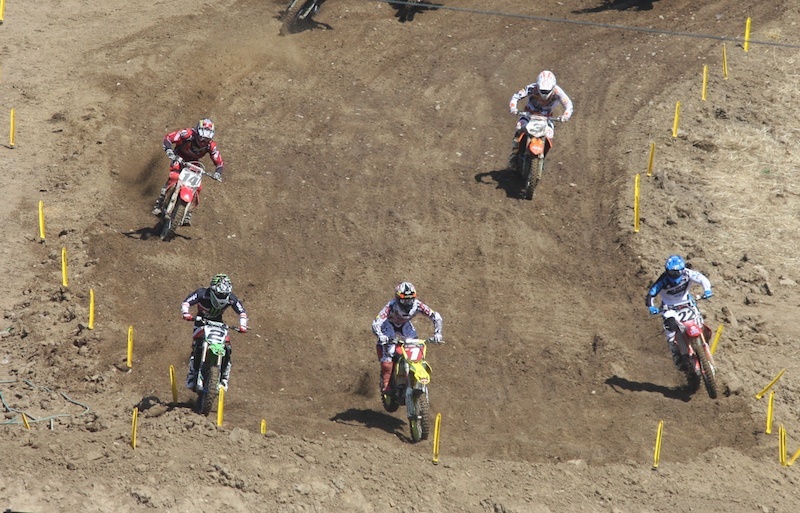 But Reed(#22), the 2009 Champion, wasn't going to settle for 2nd place and passed Dungey (#1) around a bend. 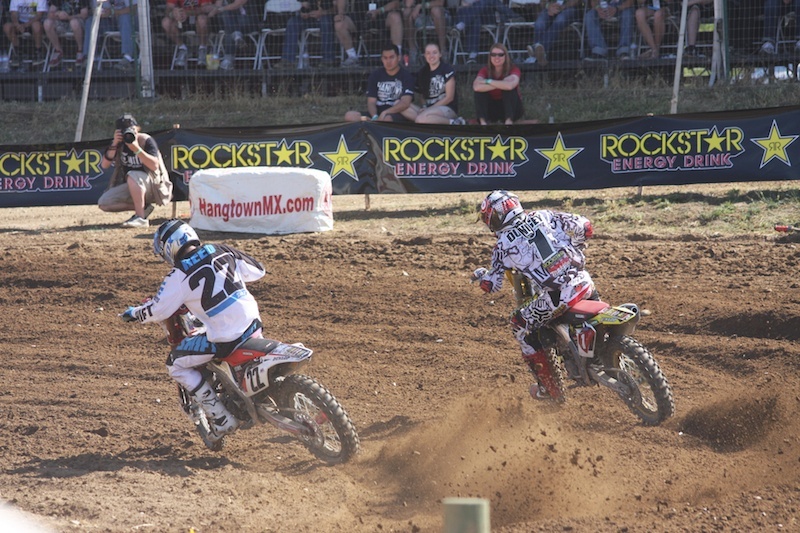 Chad Reed (#22) ended up with a pretty good lead over Dungey (#1) and won the race. 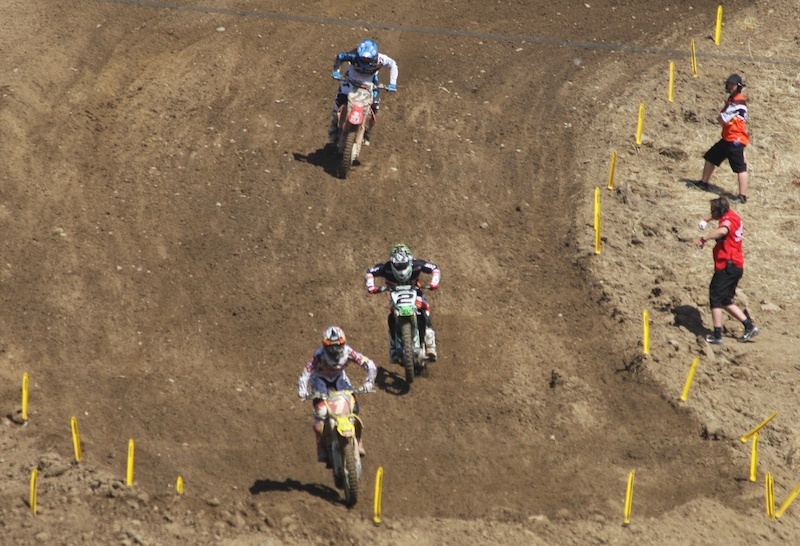 Villapoto (#22) finished 3rd overall. 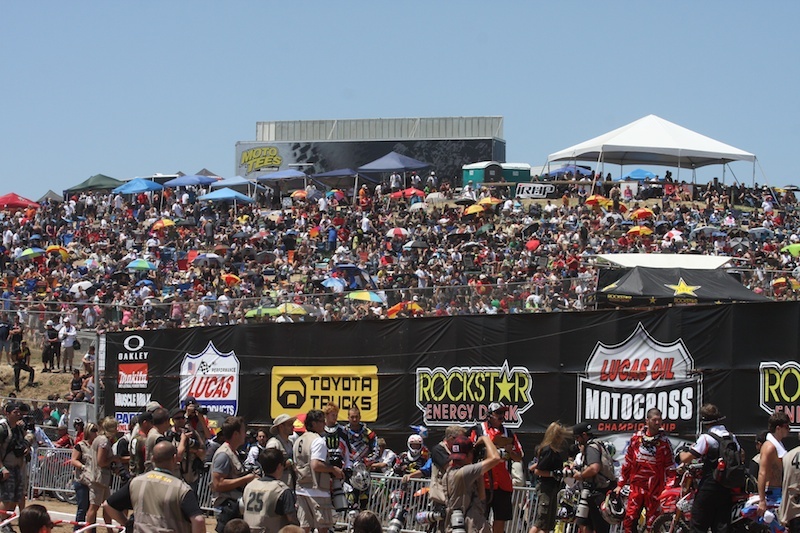 There are 11 more outdoor motocross events this season throughout the country. But I think I'm good to go till next year. I'll remember to bring ear plugs. WOW that would be fun to watch. But you're right about the need for earplugs.